[Dustin Evans] wanted to used his original NES controllers to play emulated games. The problem is he didn’t want to alter the classic hardware. 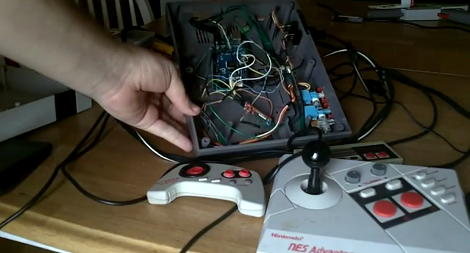 His solution was to use the connectors and enclosure from a dead NES to build a Bluetooth translator that works with any NES controller. Here he’s showing the gutted half of an original NES. Although the motherboard is missing, the connectors for the controllers are still there. They’ve been rewired to an Arduino board which has a BlueSMiRF modem. The controller commands are harvested by the Arduino and sent to whatever is listening on the other end of the Bluetooth connection. He also has plans to add a couple of SNES ports to the enclosure so that those unaltered controllers may also be used. In the video after the break [Dustin] walks us through the hardware setup. He then demonstrates pairing the device with an Android phone and playing some emulators with the pictured controllers. YES! That Nintendo joystick was awesome back in the day! Using it was the only way I could get through that battletoads level where you were holding on to the big roller thing that looked like a lawn mower in the tunnel. I didn’t have one myself, but I permanently “borrowed” my friends. Heh, I still use my original NES Advantage for various games. I went the easy route though and simply bought a USB to NES adapter. It is kind of funny. I have a 17″ high end Alienware notebook that I have attached to it rabbit ears for TV signals and that NES advantage. Progress! Really cool idea. Please, tell us who that tune is composed by?